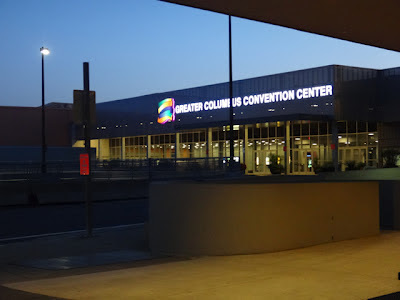 I took a bit longer holiday this time and visited Columbus, Ohio with some friend and TICA Director/Judge Hisae Tasaki. Propose for this trip was to see the TICA Annual Show which more than 400 cats/kittens are going to participate! To meet the people again whom I received their favor in this May, attend the show with our cat and have photo session of Helmi Flick and Tetsu Yamazaki… So many ideas were propose of this 5 nights/7days trip. For me, this were the very first cat show to attend outside of Japan and were so excited to go just like a little child waiting to go to the picnic. As Yasuyuki had to take our AMAN GROUP Alice of POPOKILANI, he took the different flight. 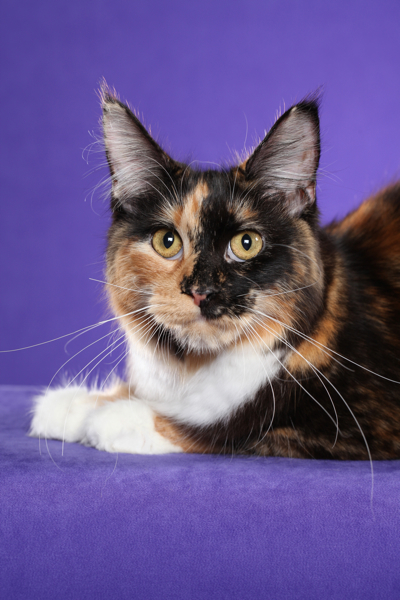 Alice is a Black Torttie & White Girl, whom just became 8 months old. winning!” were this time’s theme for us. Columbus Convention Center was the Show hall. About 10 times or more large than the usual hall we have shows in Tokyo Japan. There were 12 rings, back to back style. Total numbers of cats/kittens were 403. 123 kittens, Champion 90, Alter 59, etc. Even if we have brought our RW cats with the best at time, I was not sure if they made the finals. The level of the show was that high. Bengal is the largest registered breed in TICA and it is more than 6,000. Next comes the MC and approx 2,600. I think this is one of the reasons why there were so many Short Haris. Total numbers of the Championship MC were 14. And some were the 2011-2012 IW/RW holders. 4 were the girls and only one of them, the silver girl was chosen for BOB. One of the Brown boys was the Pajocoons Theobromine of Chemicoons. He seems to grow 2 sizes larger than the time I met him in this May. Meeting Theo and Liz again was a great time. I even met Theo’s Junior Exhibitor Zach, his brother Nathan and there mother. And of course there were Susan Milburn with our Einstein’s younger sister. She looked like Ein, having a nice boning and big beautiful eyes. She was wining 3 finals. Well about the 4 girls in the Championship ring, a silver girl of Whatatrill Silver Star was the only one selected for BOB. Janet B. 's proud girl she was! Was a surprise to know that the Brown torbie girl was the very one who was attending KKCC show with Bushido! She was in the kitten class last April, now turned into a beautiful MC. Her Mom Valerie M. noticed Yasuyuki! What a happy reunion! In Alter class, there I saw CascadeMtn Creme Brûlée of CoonAmor with Jan Horlick! Jan is my best “POKE” friend in FB. Bru is a Cream boy who became 2 shows SGCM! I knew them through the uploaded pics at FB and finally had a chance to meet them too. His color is also a minority one even in US, but wining so quickly means he has so many things to shown and to be evaluated. Also I would like to note that he has beautiful eyes which are more than a cat. I mean showing the wisdom and also telling others that he clearly have his own thoughts and ideas. Additional to this thrilled feeling, I met Marie-Jean Statesman, the original mom of Pajocoons Cattery. This time Wim was not in US, but his sister was. Both were so nice and warm. It is always the best to see people face to face event the technology is developing. MJ told me how Pajocons Sunrise Dream has been doing these days. I am strongly looking forward to meet him and all the Pajocoons family members, of course TEALC and his sisters, his human parent this Autumn. I love Sunny as the way he is. He seems that has no interest about the show but love to sun bathing at his garden. Hope he likes the green tea fields in front of our house too. "PAJOCOONS Sunrise Dream of POPOKILANI loves to bath under the sun"
Every time when I here that he is enjoining the sun and the open air of where he lives now, I think about of "The Story of Ferdinand" written by Muruno Leaf, illustrated by Robert Lawson. In my younger days, this was one of my favorite book and till now. Sunny must be a really tender, mild and peaceful boy. Have the looks of Tealc, whom I adore for a long time. Another main issue I have to write here is about Helmi and Ken Flick. I knew both for the many cat fancier at the show in Japan were often talking about Helmi’s great work. She has not been to Japan for several years and thus I did not have a chance for the photo session. I heard about her also from Tetsu & Hiroko Yamazaki, who are the friends of them. To have her photo session was on the top of my whish list. Yes I finally met her and she took pics of Alice. I am so happy to have the beautiful pic of our Alice! All rights reserved by Photographer Helmi Flick. No copy allowed. I wish to visit US again with each Sunny and Ein's junior next year!